Like most freshmen arriving at college for the first time, Kristine Anigwe had some difficulty finding her way around campus. Locating her morning classes proved to be tough — as was finding the locker room for the University of California women's basketball team. "It took about two weeks to remember where it is. I kept going down the wrong stairs," Anigwe says, laughing at the memory of being lost in Cal's Haas Pavilion. And when she did find the locker room, it took her awhile to get inside. "I didn't have fingerprint access yet. So I had to knock and wait for someone to open the door for me." Such are the troubles of being the new kid. But while Anigwe has looked like any other freshman off the court, she's looked like an old pro on it. The 6'4" forward/center's 10 double doubles are the most for any freshman this season. She also leads the Pac-12 in field goal percentage (and is 14th in the nation), at 57.8%. In December, she had 43 points against Sacramento State — the second-highest single-game performance in the NCAA this year. "She's a freshman everywhere but the court," Cal coach Lindsay Gottlieb says. "It's funny when Kristine doesn't know where she's going [around campus]. But she's a super talented basketball player. When that ball goes up, that's when you forget she is a freshman." Born in London to Nigerian parents, Anigwe and her family moved to Arizona when she was four. She wasn't much of a basketball player in her early years, despite being one of the tallest girls growing up. "People would always look and ask, 'Do you play basketball?'" Anigwe remembers. "I played soccer at first and then gave basketball a shot in seventh grade." By ninth grade, Anigwe was on the varsity squad at Desert Vista High in Phoenix, even though she was still very green. "I didn't know what was going on on the court. At all," she says. That was evident during her first shot attempt in her first varsity game. Anigwe wasn't comfortable with the ball in her hands. As a result, she looked like she was playing a game of hot potato. "I got the pass and just threw the ball up," she says. "It only hit the backboard. It was embarrassing! I wanted to get subbed out immediately. In my previous [basketball experiences], I was just told to stay on the block. I'd get the ball for a quick layup. I didn't do much. But now I was playing varsity and I had to do more!" In the years that followed, Anigwe's attitude toward basketball changed, and her knowledge of the game grew. So did her numbers. As a junior, she averaged 16.2 points (an 11-point increase from her freshman year) and 7.2 boards per game. She led her team (30--2) to a Division I state championship and committed to Cal. Around this time, Anigwe says she was diagnosed with an iron deficiency, which explained all the times she was exhausted after practices and games. But that didn't slow her rapid rise. Anigwe received her American citizenship in June 2014. Just days later she took the floor to represent the United States in the FIBA under-17 world championships in the Czech Republic. She started taking iron tablets and also changed her diet. "No junk food when I was preparing for U17!" says Anigwe. (These days she loads up on spinach but occasionally treats herself to Nutter Butters and cinnamon Teddy Grahams.) A rejuvenated Anigwe helped the U.S. win the U17 championship. During her senior season, Anigwe continued to flourish. She put up 17 double doubles, while averaging 21.1 points and 11.3 rebounds per game. Before Anigwe arrived at Cal, she won another gold medal, this time with the U19 team. "I was very impressed with her improvement between the time she was a junior and when she arrived here," Gottlieb says. "She developed so much — especially playing with the USA basketball team. And her confidence skyrocketed. 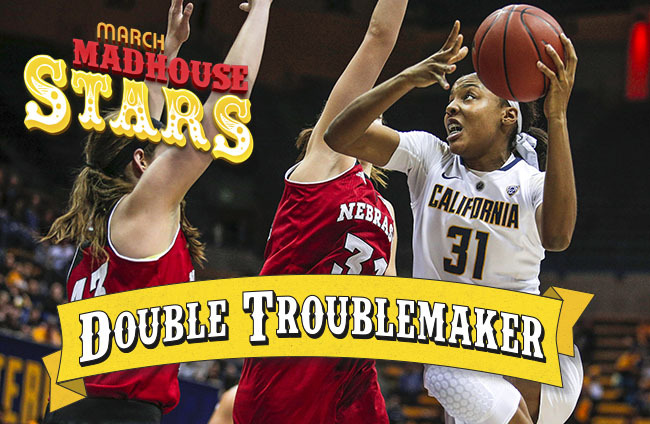 She came to Cal as the best player in her class." Anigwe, the 2015 Gatorade Arizona Player of the Year, also showed up at Cal as the only girl with experience competing in a national slam dunk competition. Going up against the boys at the McDonald's All American Games was scary. "I made all of my dunks when I practiced, but I know I'm not good at dunking in front of large crowds," she says. "I was a little nervous and had sweaty palms." Anigwe, who was at least three inches shorter than the other dunkers, didn't revert back to her hot potato ways though. She remained committed to the challenge. However, Anigwe didn't succeed in any of her attempts. Even in the face of defeat, it was a gutsy move Anigwe doesn't regret. "I participated because I knew it would be fun, and I just really wanted to push myself," she says. "I wanted to compete in something I hadn't done before." Although she hasn't dunked at Cal — at least not yet — Anigwe is still doing plenty of remarkable things. Her 18 field goals in just 24 minutes during her 43-point explosion against Sacramento State is the highest single-game total in the NCAA this season. The 117--99 win, in which Cal set a new school scoring record, didn't just solidify the fresh-faced newcomer with braces as one of the top first-year players around. It showed that she is one of the top players, period. Anigwe is proud of that game, but what she remembers most about the contest is how fast-paced it was. "It was a like a track meet!" she says. "I was so out of breath." So much so, that Anigwe jokingly says she wanted coach Gottlieb to sub her out. The game showed how far Anigwe has come in the last four years. She was no longer chucking up baskets recklessly like she did as a high school freshman. She's become comfortable as an offensive leader, pounding the paint and crashing the boards (she had 12 rebounds in the game). Her performance against Sacramento State was also big news on the group chat she started with several other women's college basketball stars, including Connecticut's Katie Lou Samuelson, Notre Dame's Arike Ogunbowale, and Louisville's Asia Durr. "A couple of them joked around and asked 'Who did you guys play? High schoolers?'" Anigwe says. "I just laughed at the messages. But they know I worked for those points!" The group chat has also provided support during trying times. "If one of us is having a rough stretch, we send each other positive texts. I'll tell them, 'You got this. Keep working hard,'" Anigwe says. Those are words that Anigwe clung to when the Golden Bears had a bumpy start at the beginning of the new year. Although her team was struggling in conference action, Anigwe was able to record a double double in five of her first six conference games. Even though she has already been named Pac-12 Freshman of the Week seven times, Anigwe wants to do even more for the Golden Bears. "After we suffered a bad loss at Arizona, I told the team that everyone needs to look internally and think about what they can do to help get us better," Gottlieb says. "The following day was an off day, and I didn't expect any of the players to contact me about what I said. But Kristine called. She said, 'I want to be a stronger leader and get better on defense.' Kristine is having a fantastic year individually, but that's not enough for her. She is fully committed to helping this team get better." That commitment means guiding the team through the remainder of its Pac-12 play and conference tournament, where her presence makes the Golden Bears a team capable of pulling an upset at any time. In the meantime, Anigwe, who aims to play in the WNBA when she's done at Cal, is adjusting to college life and enjoying a public-speaking course, in which she recited Kobe Bryant's retirement poem in front of the class. "The poem was so relatable and motivational because Kobe expressed his passion for the game. I can relate. I love the game so much too," Anigwe says. She is also learning about TV journalism. Anigwe shadowed Golden State Warriors reporter Rosalyn Gold-Onwude in January. 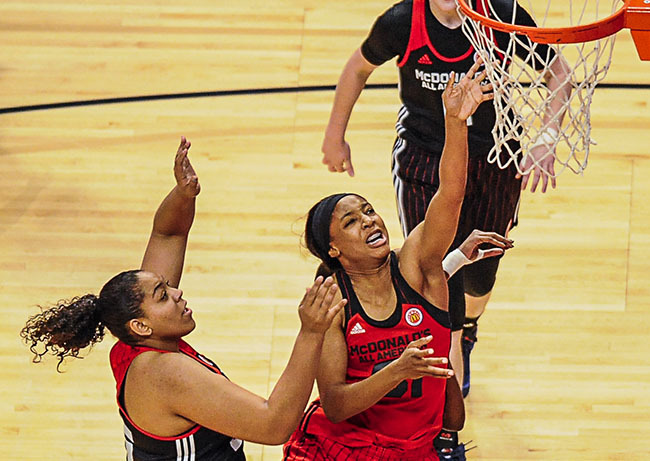 The experience opened Anigwe's eyes to what she is considering as her post-basketball career. She is not in a hurry to start reporting though. "I didn't realize how much work Rosalyn had to do," Anigwe says. "It's kind of like a basketball game. You have to prepare, get all of your information before the game and take a look at the matchups. Then there's player interviews. I watched her talk to [Warriors guard] Klay [Thompson] which was really cool. But I also realized that I want to play basketball for as long as a I can, because reporting is a lot of work!" Anigwe is O.K. with the work she is expected to do for the Golden Bears, though. She may be just a freshman who's had trouble learning the Cal campus, but Gottlieb has confidence in Anigwe and her ability to lead the team to success. "Kristine is a huge piece to what we're trying to build here," Gottlieb says. "We've set the bar high, and I know she's going to do everything she can to push us far."